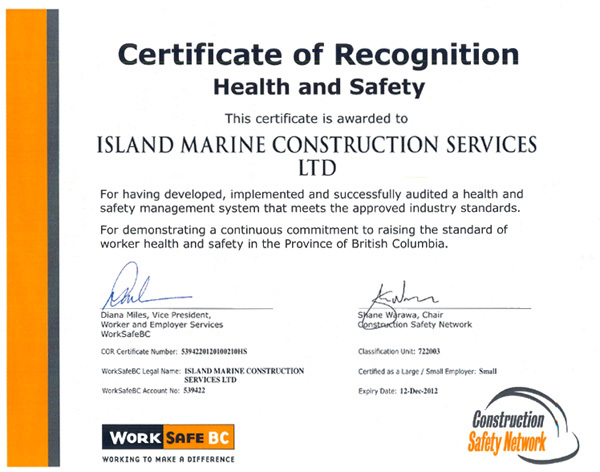 Island Marine Construction Services Ltd. is committed to protecting the Health and Safety of our employees, clients, sub-contractors, the public and the environment. It is the ultimate goal of Island Marine Construction Ltd. to achieve and maintain an injury and incident free work place. To this end, the company has developed, and is committed to, the continuous improvement of a comprehensive Health, Safety and Environmental Management System. Promote off the job safety to assist employees in protecting themselves and their families from harm away from work.